Sharp-tailed Sandpiper, 3rd Idaho record. Multiple birders got to see them and photograph them. The birding world has changed and continues to change...for the better. In recent years the numbers of state/provincial first records of bird species has increased dramatically. Some may say that climate change is the cause. Climate change, environmental changes perpetuated by humans, or naturally occurring earth cycles all may have something to do with it, but I submit that digital bird photography is the leading cause of all these new bird records. Back in the day, a new record bird only counted because they had a skin in the hand. The naturalist had skillfully plucked that bird out of the air with a shotgun. Then with the advent of binoculars and bird guides a new craft emerged...the skill of field identification and note taking. Technology has advanced and digital photography is now widespread and super convenient. Almost all of us have a digital camera in one form another, be it your cell phone, an inexpensive point and shoot, or a professional quality dSLR. Digital photographs seem to be the heir-apparent to skins and notes. Long-tailed Jaeger, another Idaho vagrant wherein photos aided in establishing its identity. In no way do I want to diminish the art and skill of field identification. Nor do I wish to offend those who have worked tirelessly to perfect it. I too continue to work to develop those very skills. But, a photograph is much better evidence for a bird record than someone's notes, no matter the quality of the writing. Frankly, I don't trust other people's notes. Who knows for sure when and where those notes were written. Were they copied out of a field guide or at least influenced by the field guide as the birder convinces him/herself after the fact of what species they saw? I suppose one could logically carry that same concern into the world of digital images of a bird...were the photos really taken where the birder said they were taken? Pretty much all of the new cameras, even phone cameras, are geo-tagging the images, so that helps us overcome the location question. Although a very poor image taken with a point and shoot camera, this photo along with a couple others were sufficient for the Idaho Bird Review Committee to accept it as a record for a Rusty Blackbird. The fact is, it is so much easier for a review committee to accept a rare bird record when it is accompanied by photographs. If the photograph reveals sufficient diagnostic identification information, BAM!...the record is added with little discussion. Acceptance of a bird record based only on notes still has everything to do with the reputation of the birder. Photographs are indiscriminate of birder skill and bring instant credibility. Because of the ease of communication we are able to get many more birders onto a rare bird. Because of the ease of digital photography we are able to get many more images of birds. And because of those images we get more birders excited to go see birds. Because we get more eyes on the rare birds and usually multiple images of them we get more accepted new records. So, when it comes to new bird records, while I'd be excited by someone's notes and report and I'd probably chase it, I still want to see a photo, even if I have to get it myself. 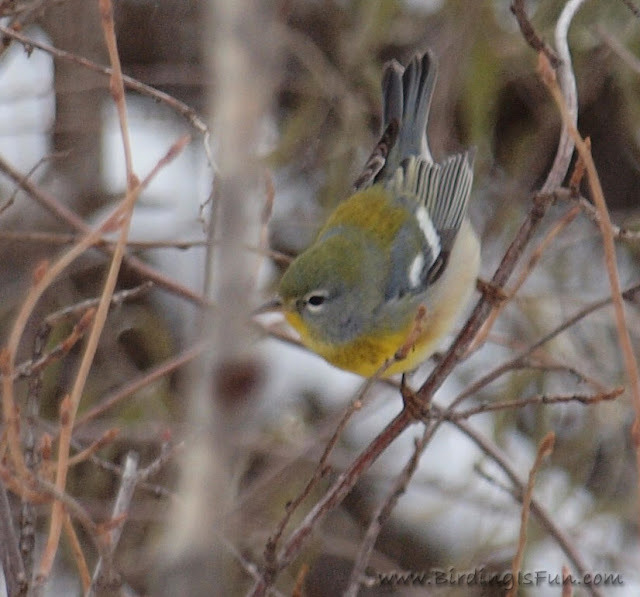 Northern Parula seen in winter in Boise. Several people had seen it before me, but my photos excited many more birders to go and see it and the record was easily accepted. Can I be the first to disagree, at least partially? I agree that a photo often helps quickly verify many species. And for answering 'what did I see?' or the report of a rare bird by an inexperienced birder, I want to see a photo before I am fully convinced. But in the case of many rare birds, a detailed written description is often superior. As far as 'copied from a field guide,' that's not the description I would seek. I'm talking about detailed plumage descriptions that aren't discussed or shown in the field guide's brief text and illustrations of various quality. Such descriptions often describe features that aren't obvious in just one or two photos. In fact, there are rare birds where the written description was accepted by the rare bird records committee when the photos were not accepted, because the photos were not unambiguous. Flight style and behavior, habitat, calls and songs. These are better with video and audio recordings. But written notes still would trump photos for these important identification details. Yes, I want photos, but often they don't show everything. A written record shares the experience. Observing intently in such detail that you can write hundreds of words of description really improves your field ID skills. Snap a quick photo and move on to the next bird and you're no better off identifying the same bird the next time you see it. Thanks for weighing in Greg. Do you agree or disagree with my premise that photos are the reason we are having more and more vagrant bird records being approved? I suppose I assuming that we have an increased rate of vagrant bird records. You also brought up a great point that I thought about but failed to include in this post...video and audio. We all generally have the ability to add this to our photos for rare bird sightings and they will make committee reviews even easier. I too enjoy the written account of how a bird was seen and what it was doing and sounds it was making. Very helpful, but again, someone could just make it up and glean such details from a book or online. I also think many birders get better because of photography. When they study the photos they learn as much or more, especially the finer details of the the bird plumage and get a strong sense of shape and size. When they see it again in the field they are better prepared to identify or recognize it. Now some birders snap away and never examine their photos, but I'm guessing they are in the minority. Field observation and note-taking is a skill that I hope never dies, but when it comes down to it a picture is superior for reporting to the public. That fact is that if you are a new birder it does not matter how many notes you take, no one will believe you unless you have the photo. I had a pretty good look at a very late Osprey this year and gave a detailed account of what I saw. The eBird reviewer just ignored it saying that I must have seen a Bald Eagle. I agree that one quick snap is often not enough to identify a bird. This is why I take many photos of birds I do not recognize. If I think it may be a rare bird I will easily take 100+ photos and then try to shoot some video. Note taking is fine for those who want to spend all day observing a bird and do not plan on submitting reports to rare bird committees. Maybe even write a poem about the bird you see. For those who want to positively identify a bird and have it accepted by others photos are a necessity! Photos are the next best thing to a specimen. Let's consider what has happened in the last decade. 1. We got rid of film... and the digital images at a zoom level are exponentially better 2. We removed storage problems. You can post to cloud accounts like Flickr rather than scan them or email them back and forth on a hard drive. Therefore, you can send the URL rather than the image itself. 3. Bandwidth has increased so that images don't take long to load for browser viewing. 4. Cameras have become infinitely smaller and significantly lighter. I now carry a Fujifilm mega-zoom with a 750mm capacity at the highest zoom. While it does not have the quality of a DSLR, image stabilization provides a fairly good image. All of this has happened since about 2005. While I agree that good written documentation is essential, without photo-documentation, you're short of ammunition. How short is up to the state's rare bird committee. The bottom line is that unless a bird flies too quickly for a photo, the excuse that you didn't carry a camera with you is going to be viewed poorly. I agree with you completely, that the increase in rarities can be directly attributed to not just an increase in photos, but a general increase in the number and inter-contentedness of birders. 10 years ago, if someone shot a great picture of a rare bird, but didn't have the skill to ID it themself, what would they do? Ask a few friends, who may be as stumped as them, and move on, most likely. Now, people can find help on the internet, especially with tricky ID problems. While I agree that note taking and behavioral observations are a necessary (and oft neglected) skill, Many times what an observer describes and what a picture shows do not necessarily line up. An observer may interpret field marks incorrectly, especially if they are inexperienced with a species. Someone may, in all honesty, describe a redpoll as very pale, frosty looking above, small billed, with limited streaking on the sides and under the tail, a pale rump, and pictures could show a perfectly ordinary Common Redpoll. I've heard many descriptions which included behavioral details and fine plumage characteristics of supposed rarities which, when a picture was produced, turned out to be a slightly odd looking more common bird. Some of the descriptions might even have been good enough to pass a records committee. So I'd say that, in a world where more and more people are getting into birding, at various levels of skill and interest, that photos become ever more essential. That being said, I don't own a very good camera, and have had to prove my sightings the hard way, and let some birds go because I just didn't consider a rarer species.. Maybe that late Common Nighthawk i saw was actually a vagrant Lesser. Without a picture, I'll never know.. I think we are going to see masses of fantastic birds first being recorded by "clue-less" photographers (clue-less as in not having great field bird identification skills) simply because there will be masses of people photographing birds and now have ways to get their mysteries identified, whereas true birders with great ID skills will be in minority. To some extent this is already happening. Considering how inexpensive the point and shoot cameras have become some of which you can get over 2000m equivilant out of, there are few excuses really why not to get a picture of rarity. 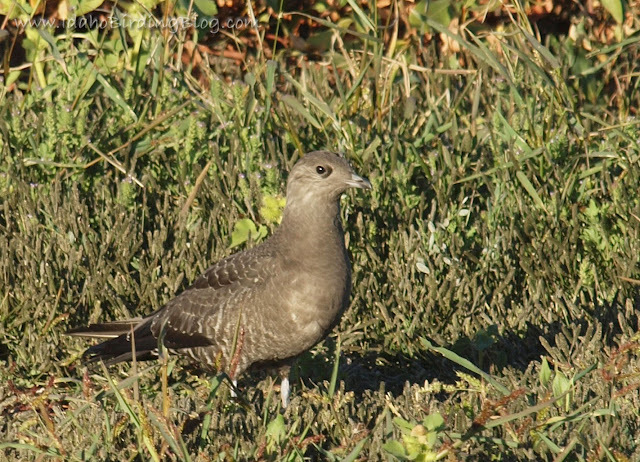 See Stephem Ingraham's post on Birding 101.